Want To Do A Little Astrophysics? 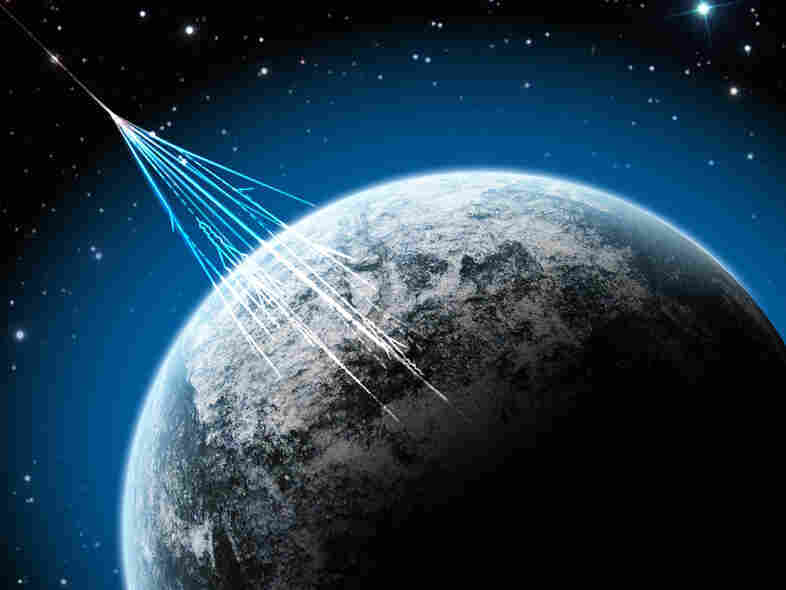 This App Detects Cosmic Rays Two physicists keen to detect a a very rare, high energy particle think you and I can help. The researchers are working on an app that would allow any smartphone to detect rare particles from space. Smart phones contain a silicon chip inside the camera that might be used to detect rare, high energy particles from outer space. "We were, of course, fiddling with our smart phones, and that's when we realized, 'Hold on a second, these smart phones can actually be used as particle detectors!' "
The project is the brainchild of physicists Daniel Whiteson at the University of California, Irvine, and his buddy Michael Mulhearn at the University of California, Davis. Both spend time in Switzerland, working on the giant particle accelerator known as the Large Hadron Collider. Whiteson says the Large Hadron Collider, located in a tunnel beneath the Swiss-French border near Geneva, is so huge and so complicated that scientists must share their time on the collider. One day back in November 2013, Whiteson says, he and Mulhearn were visiting a local watering hole in Geneva. "We were having beers and thinking [about] what could we do that's smaller scale, that we can handle ourselves. And while we were chatting," he says, "we were, of course, fiddling with our smart phones, and that's when we realized, 'Hold on a second, these smart phones can actually be used as particle detectors!' "
The particle the two were interested in detecting is something called an extremely high energy cosmic ray. These particles are far more energetic than anything that even the Large Hadron Collider can produce. Physicists would dearly love to figure what's producing these energetic particles, but they are very rare. Physicists estimate that, in any century, only one particle falls on a given square kilometer of Earth. That's where the smart phone comes in. Whiteson and his California pals, as well as new collaborator, Kyle Cranmer at New York University, are building an app that turns the CMOS chip in the phones camera into a particle detector. They're hoping millions of people all over the globe will download the app. "So if we have a bunch of users nearby each other, all running the app, they will all see hits in their phone, they'll see particles being detected by our app in their phone in the same moment," says Whiteson.